If there is a particular relationship a woman worker wanted divorced from to free herself of a major burden, it is her unhappy marriage with endo, the women committee of labor group Partido Manggagawa (PM) said in a statement. The Women Committee of Nagkaisa is spearheading a Women March to End Endo tomorrow, March 6, from Plaza Salamanca in TM Kalaw to the Department of Labor and Employment (DOLE) main office in Intramuros. Endo (end of contract) represents the dominant form of temporary employment in the country characterized by deceptive trilateral relationships between the principal employers, service contractors (middlemen), and the workers. According to PM, endo and other forms of contractualization affect more than a third of Filipino workers in the formal economy but are implemented wider in the services sector of the economy occupied mostly by women. Contractual workers receive low wages and denied other social security benefits. They also are denied the right to unionize and bargain collectively for the rightful share in the product of their labor. “Contractualization, therefore, has a woman face as women comprise the majority of employed workers in the services sector where endo practices are rampant,” said PM Secretary General, Judy Ann Miranda. More than half (56.3%) of the total employed persons in the country are in the services sector, according to 2016 survey of the Philippine Statistics Authority (PSA). In 2015, women made up 51.2% of service workers and shop and market sales workers; 17.1% of farmers, forestry workers and fishermen; 15.4% of trades and related workers; and 14.1% of machine operators. “Malinaw dito na hindi lang pasan ng mga babae ang mundo, pasan din namin ang endo,”declared Miranda, three days before the celebration of the International Day of Women. Women workers, according to Miranda, already bear multiple burdens at home and at work and their unwanted bond with endo is one of these that they wanted to unload. “Divorce or separation should always be an option for battered and exploited women,” argued Miranda. The labor coalition Nagkaisa wherein PM is one of the members, is pressing Labor Secretary Silvestre Bello III to finally come up with a new regulation prohibiting endo and all forms of contractualization. Bello was also instructed by the President to do the same after meeting with labor leaders last February 27. On March 2, Nagkaisa started its 30-day countdown for labor officials to issue the prohibit order. 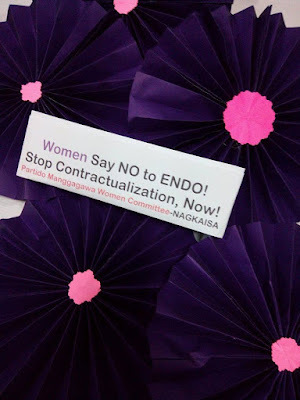 The rally tomorrow is part of the "end endo" countdown.